Emma Maxwell has designed a restaurant installation for The Marriot Hotel Group, entitled ‘Find your Lucky Star’. Acclaimed interior designer Emma Maxwell and her team have recently finished a restaurant installation named ‘Find your Lucky Star’, which will be hosted by The Marriot Hotel group and the Sheraton in Kuala Lumpur. An exploration into “seeing things differently” and making “dreams come true”, the installation will submerge guests into an evocative “other world”. Maxwell and her team wanted to use the installation to explore the idea of ceremony, and how it is often associated with dining experiences. A pop up installation, ‘Find your Lucky Star’ reflects on the effect dining can have on all the senses. The dining experience takes place within a free standing structure with a minimal, brutalist-inspired exterior; entering the space, guests will take their places at the table amongst a scene that is entirely fantastical. Imagery of clouds and treetops make up the space’s floor and the bottom of the walls, whilst the ceiling remains dark and intangible. Maxwell has designed the space so that upon entry, guests feel that they are in an “upside down” landscape, and they begin to question their surroundings. 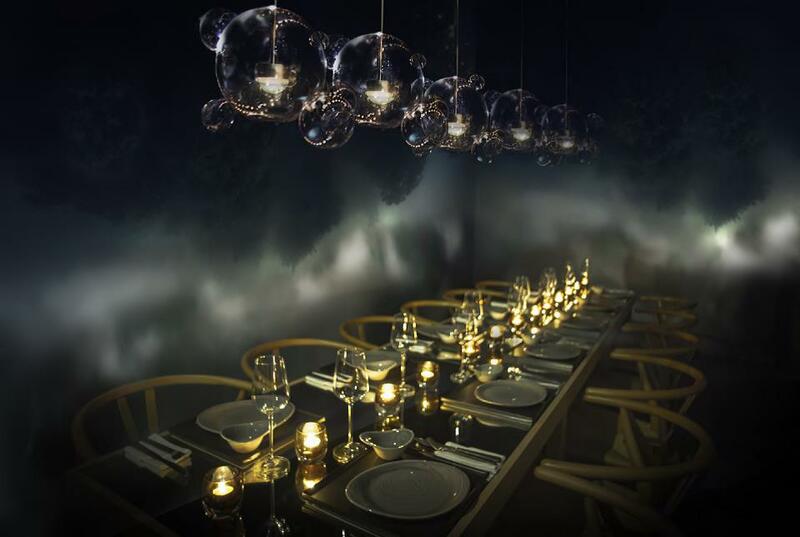 To enhance this otherworldly feeling, a 3 metre long table has been custom made using a mirror, whilst bespoke, hand crafted clear glass ‘cloud’ lights hang from above. Gradually, the diners begin to adjust to their environment as dinner is served. By the meal’s third course, the dark void in the ceiling changes and begins to shimmer. Maxwell’s installation slowly reveals a deep night sky, with stars twinkling above the guests’ heads. 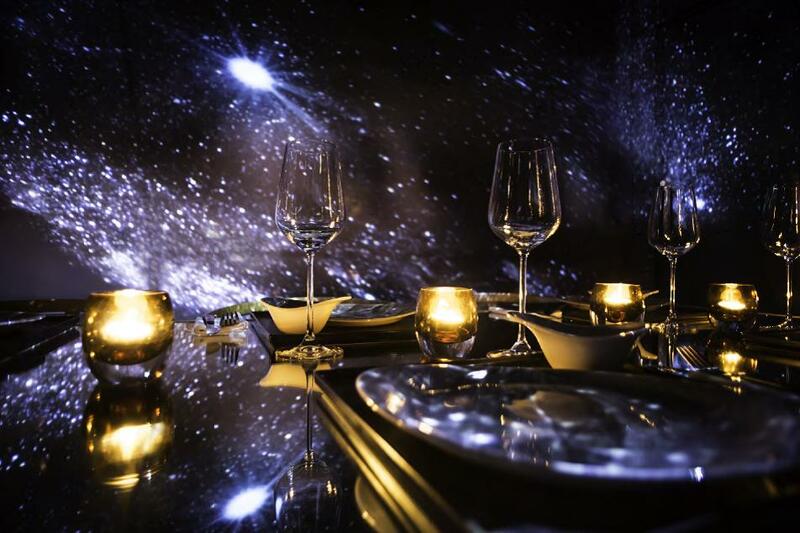 As dessert is served, the clouds and trees below the diners should have disappeared, and guests should be fully submerged within the moving, glittering star-field. 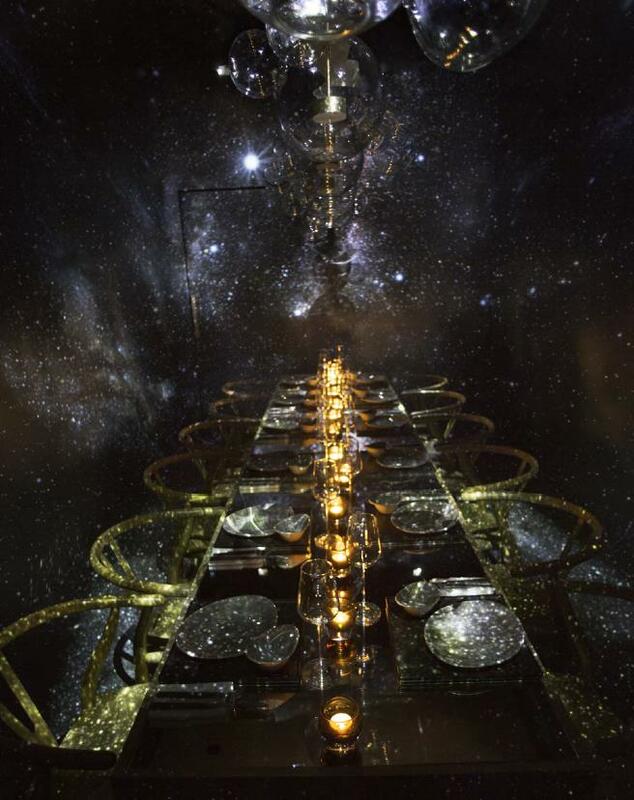 Having watched the installation bring them into the heart of the shining galaxy, guests are invited to search the heavens for their ‘lucky star’ and make a wish as their finish their meal. The star-field film that is used to encompass the space was designed by celebrated Australian film director, Damon Escott. There is also a sound scape that works alongside the exhibition, which has been created by screen composer and music producer, Ben Rosen.